2 What Is an Elevated Cooling Bed? Finding the right place for your dog to sleep is vital, especially as over-heating or getting too cold can be a major problem for his health. Yet, this is an issue that many people never even think about. A great choice these days is to look for an elevated cooling bed for him. This is just one of the styles around now but a lot of Cockapoo owners find that elevated cooling beds work best for their four-legged buddies. If you aren’t sure which bed would be best for your Cockapoo you might want to check out this selection of some of the top models. With breathable mesh fabric and sitting at a nice height off the ground, this AmazonBasics Elevated Cooling Pet Bed is a solid choice for keeping your dog nice and cool. It will keep him some 7 inches (17.8cm) off the ground while he is on it. This bed is easy to assemble, with screws and a hex tool included. It is also easy to clean after he has used it, as you can machine wash the mesh fabric or else just spray it down with a hose if you prefer. The surface area has a size of 38 by 26 inches (96.5 x 66 cm), so it is more than big enough for a Cockapoo to rest or sleep on. This good quality pet bed can be used easily either indoors or outdoors. It comes with a strong frame that can support pooches of up to 30kg, so the average Cockapoo will be perfectly fine on here. The canvas fabric is coated to protect it against mildew and mould. In terms of size, the height is 20cm while the length including the frame is 110cm and the width 80cm. A sleek black finish means that it should be able to fit in to most houses easily enough without looking out of place. This big Easipet Elevated Pet Cot Bed for Dog is particularly good for bigger dogs or for those pooches who love to have a lot of space to move around in. Having said that, even a modestly sized Cockapoo should appreciate the comfort that it offers. It has a nice design, with a black frame and red cover making it looking stylish enough for even the most fashion-conscious dog. It is worth mentioning that it uses a unique Velcro design that lets you tighten the cover very easily when needed. The whole thing measures 122cm x 91.4cm x 18cm and comes flat-packed with assembly instructions. Strong and sturdily built, the PawHut Dog Cat Puppy Pet Elevated Raised Cot Bed is a high quality choice for keeping a lucky Cockapoo off the cold floor this winter or cool in the summer. The 600D Oxford is tough enough to not tear even with a heavy or clumsy dog on it. A nice touch comes with the fact that the bed is light enough to be easily moved around, giving you more flexibility in terms of where you use it. It also has a plastic anti-slip mat with it. The design is a stylish blue and black colour scheme and the overall dimensions are 91.5cm x 76.2cm x 18cm. If keeping your Cockapoo cool and comfortable in warm weather is a concern that you have then this dog cot could be ideal. It uses a 600D polyester cover and can hold up to 150lbs (68kg). This bed is lightweight and also easy to clean. Indeed, to clean it you just need to wipe it down with a wet cloth and soap. The overall dimensions for this dog cooling bed are 91cm x 76cm x 18cm. What Is an Elevated Cooling Bed? This type of doggie bed is typically made out of a tubular metal frame that is raised off the ground on four feet. They then typically have fabric stretched over the top of this frame. This means that the dog lies down in a higher, more comfortable position than on the floor. A Cockapoo will generally enjoy being in this sort of higher position, although it is more important for bigger dogs who need to protect their joints more. In many cases, the pooch will make himself comfortable with his paws hanging off the edge of the bed casually. 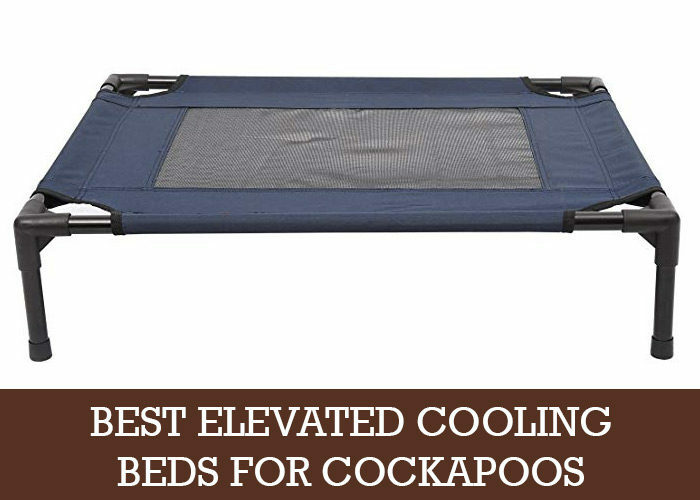 As the name suggests, an elevated cooling bed is great as stopping a Cockapoo from over-heating on a hot day. This means that it is a particularly good purchase if you live somewhere warm or if your dog has a lot of fur. Even if it is cool enough for you to be comfortable at home, dogs can overheat more easily than humans. Don’t let him suffer the heat when he can easily stay cool in this way. This sort of bed for dogs is very versatile, as you can use it in any part of the house. This is because it is light and easy to move around as well as being pretty visually unobtrusive. The fact that it is raised up off the ground means that you can also use it outdoors without it getting dirty. If you aren’t sure where in the house to put his bed, or if he moves around a lot, then this kind of bed is a good choice. There are a couple of different models around, giving him a variety of ways of staying fresh and cool. The flow of air. The simplest and most inexpensive cooling beds for dogs are made out of some sort of permeable fabric such as mesh. This allows the air to flow and keep him nice and cool. When you choose a raised cooling bed for your Cockapoo you will want to keep the following points in mind. Medium sized beds are typically a good choice for Cockapoos to sleep on. Rubber feet help to protect the floor and will also stop the bed from slipping or moving around. Strong support. With a steel or aluminium frame the bed will be strong enough to support your Cockapoo without any problems and won’t be at risk of him chewing it. A tightly woven mesh will mean that he won’t get his claws caught up in it by accident. The right level of tightness will keep him well supported and comfortable. Don’t choose a bed that has big spaces in the corners, as he could injured himself if he gets a paw stuck in here. Getting the right bed can really make a big difference to your Cockapoo at different times of the year. Just be sure to pick a model that suits him and that looks like it will stand the test of time.